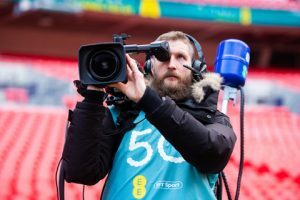 In a world first, BT Sport and EE have successfully carried out a live broadcast over 5G using remote production, delivering a two-way transmission from Wembley Stadium to London’s ExCeL exhibition centre. Showcasing the capabilities of 5G technology for the world of sports broadcasting, BT Sport’s Jamie Hindhaugh, chief operating officer, alongside presenter Abi Stephens, spoke live from ExCel in East London to BT Sport’s Matt Stagg, director of mobile strategy and lead of EE strategy for delivering 4G and 5G networks for the media and broadcast industries, with Matt Smith, presenter, both of whom were pitch-side in Wembley Stadium, North London. All production for the live transmission was carried out at BT Sport’s base in Stratford, East London. The demonstration was designed to illustrate the potential opportunities that 5G can bring to sports broadcasters. BT Sport stated it will use 5G to increase coverage of sports as well as greatly improve efficiencies, from financial to creative. Speaking to SVG Europe, Hindhaugh said: “What we’re trying to show is the opportunities around remote production. We’re not giving up on 4G, but 5G almost combines fibre and 4G, into virtualised fibre; you have the surety of signal with the flexibility of mobile. 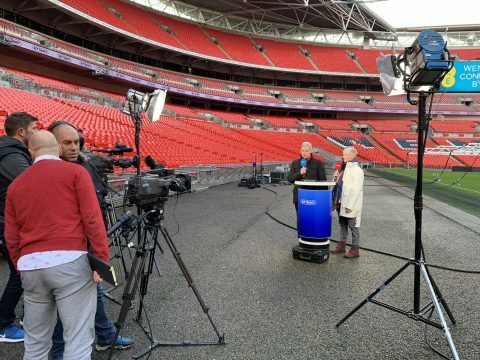 In addition, the FA-recognised EE Wembley Cup, kicking off this Sunday (25 November) at 2pm, will be the first sporting event broadcast live using 5G remote production. 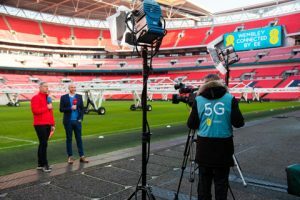 The event, featuring YouTube’s biggest footballers alongside international football legends, will be delivered over EE’s 5G network live from Wembley Stadium and then shown live on the channel of YouTube star Spencer Owen. The transmission used EE’s 5G test network in the stadium, plus a first-generation 5G encoded dongle from Huawei. The test network used EE’s 3.4GHz spectrum from its 5G antenna in the stadium, connected to a 10Gbps backhaul link. 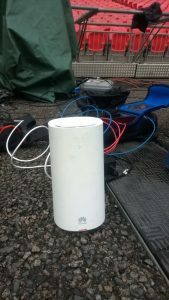 With a throughput of 75MBps at Wembley, feeds from three cameras at 25MBps each were relayed through the Huawei 5G encoder to the 5G cell in the stadium. From there the transmission passed onto the EE backhaul network, and then to the internet. Going forward, EE will use 5G network slicing technology to create a broadcast grade network for clients, providing the guaranteed latency, bandwidth and quality required for live broadcast. The company stated 5G will enable broadcasters to send match footage back to base within minutes, opening up more coverage possibilities and reducing costs by reducing the number of technicians required at each game. 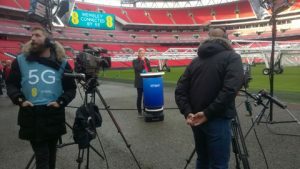 From Wembley Stadium, SVG Europe’s Heather McLean was able to become one of the first people to ever take part in a 5G broadcast using remote production. Take a look at this video here of McLean speaking with BT Sport presenter, Matt Smith. BT Group is working hard to get 5G up and running for 2019. The BT Technology team is virtualising elements of the core network for 5G rollout in 2019 and is building a next-generation 5G core in line with the next stage of global 5G standards, with virtualised network functions on a cloud-native infrastructure, creating the basis for a smart and fully converged agile network. The BT 21CN backbone network is Petabit-class, and will ensure the future-proofed scale required to enable a world-leading 5G experience. Earlier this month, EE announced that nine 5G trial sites went live across East London. The trial has so far encompassed every element of building a new 5G network, from obtaining planning permission and access agreements, through to managing power outputs. The trial will go on to assess the customer experience of the new 5G spectrum. A week later, the mobile operator stated it is switching on 5G sites in 16 UK cities in 2019. The first launch cities will be the UK’s four capital cities – London, Cardiff, Edinburgh and Belfast – and Birmingham and Manchester. Throughout 2019 EE will also be introducing 5G across the busiest parts of ten more UK cities: Glasgow, Newcastle, Liverpool, Leeds, Hull, Sheffield, Nottingham, Leicester, Coventry and Bristol. EE will launch with multiple smartphone partners, as well as an EE 5G Home router with an external antenna, to showcase the power of 5G for broadband.